Now here is a recipe that is decadent and delicious. I know that angel food cake and french toast seem like two unrelated foods. French toast is for breakfast and angel food cake is for dessert, but we have combined them together. We are going to treat the angel food cake like the bread in french toast and kick it up to a whole new level. And I won’t judge whether this should be for dessert or breakfast, that’s your call!! Preheat a nontick skillet or on a nonstick griddle over medium heat. Slice the angel food cake into 10 to 12, 1-inch thick wedges . In a shallow dish combine eggs, milk, and vanilla. Dredge wedges in egg mixture making sure to rotate and soak all sides of cake. Spray prepared pan with cooking spray. Cook wedges 1 to 2 minutes on each side or until golden brown. Cake may have to be cooked in batches depending on the size of pan used (be sure not to overcrowd the pan). 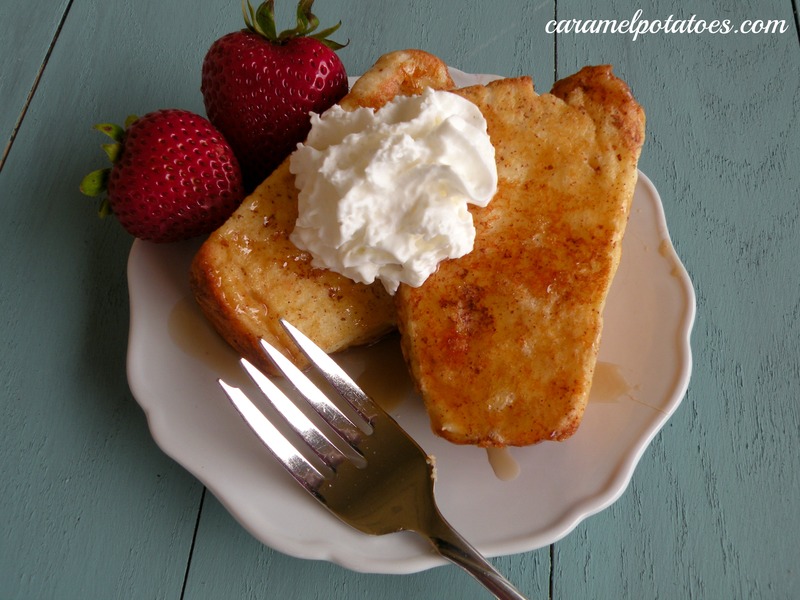 To serve, drizzle with maple syrup, whipped cream and strawberries. Serve immediately. I know this would be delicious! Sure wish I had some Angel Food Cake on hand so I could make it!